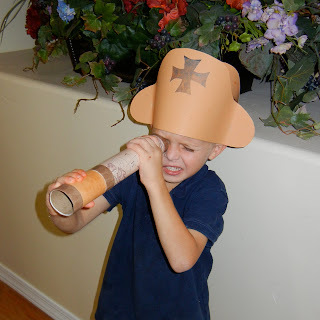 This custom fit hat and telescope project with real moving parts is something that I created for a Columbus Day craft that I shared over at Grandmotherhen.com. My grandsons have loved playing with the set. I plan to make a few more sets for when multiple grandsons are here. If you have a little boy you love I know he would love this inexpensive and simple to make play set too. Here is a link to the how to tutorial over a Grandmother Hen. Check it out! I love the intent expression! That is a great shot! You are such a good and creative Grandma!